If ever there was a time of year to come up with a productivity formula for getting more done as a freelance writer, it’s fall. See the potential fall has to ramp up your writing income? Except that you’re suddenly transitioning from sleeping late as you like to having to get up at 6 a.m. to put kiddos on that early school bus. And you’re…dragging. Also, maybe feeling the pressure that now, you’re out of excuses and actually need to do this thing. 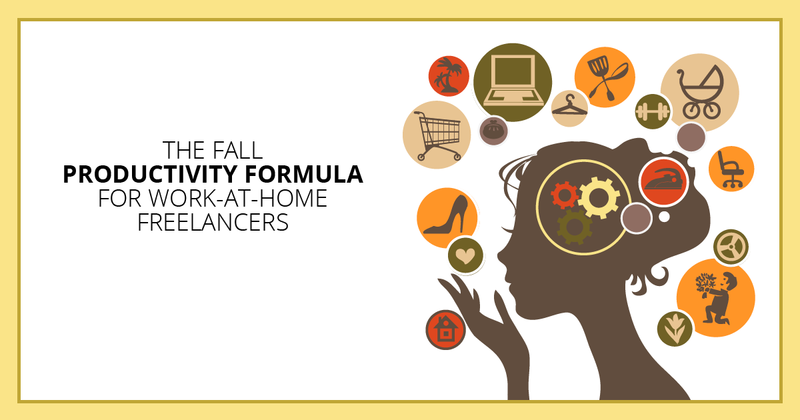 And the fall productivity formula is just the thing to help you grow your freelance writing business. Ready to get started? our coffee cup’s filled. The morning sun peeps through the window. And the house is sweetly silent. It’s the perfect environment to pursue the freelance life. Being a freelance writer can be a lonely and isolated existence. Ever feel that way? The only voice you hear all day is the one inside your head nagging you about deadlines. You get excited when a crow flies by the window. You wish the package handler who stops by your house by mistake could stay and chat. You talk to Siri or Alexa just to hear the voice of someone congenial. Working from home in peace and quiet is certainly a benefit of the freelance life. And it can be a productivity boon. But spend too much time alone, disconnected, and it can throw you out of balance. You get a freelance writing client, and you’re all excited. You think this is going to be great! Then, the wheels come flying off. Everything changes. Many writers tell me they wish they could find even one client. But today, I want to talk about the other side of the coin. Once you get rolling in freelance writing and word starts getting around about your talents, you can quickly find yourself overbooked, overworked, and exhausted. I recently had a chat with freelance writer Alyssa Ast about this on my Facebook chat — she was getting overloaded, and her personal passion writing projects were sitting idle. She’s got a passel of young kids to care for, too. And she was nearing her breaking point.